For so many in the worlds of horse racing and/or off-track Thoroughbreds, Jonathan Horowitz's face may not be immediately recognizable, but his voice is. The regular track announcer at Arapahoe Park, Horowitz has called races at 26 tracks across the United States and Great Britain and holds the distinction of having been the youngest person to ever call a pari-mutuel race, making his debut at Los Alamitos Race Course in California when he was just 14 years old. As much as Horowitz's career has centered around horses on the track, he gives them equal homage outside of the racing oval. He produces the series “Gates Open at Arapahoe Park” for Altitude Sports Network in Colorado. The show features the horses, people and stories from the Arapahoe backside, as well as horse racing topics with more national appeal, such as Triple Crown and Breeders' Cup-related content. More recently, however, Horowitz has found a new layer in his ever-expanding career with horses. 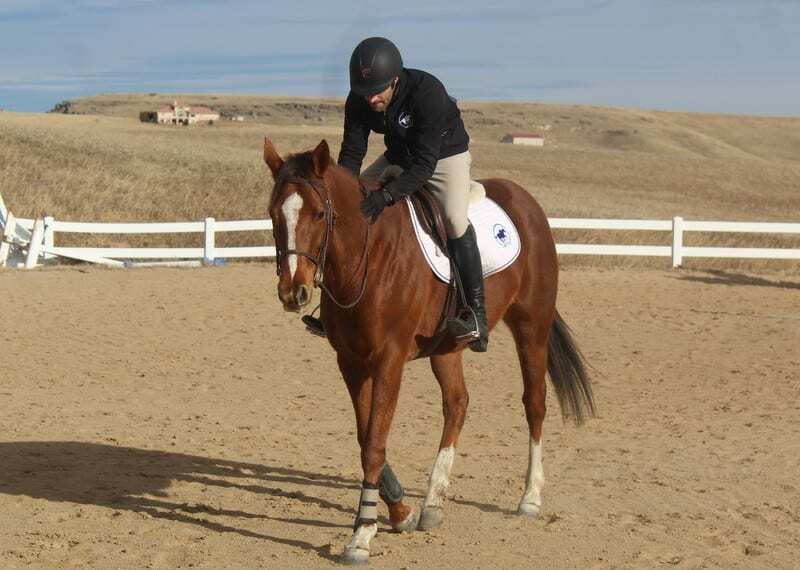 Lately, rather than calling the action from his perch high above the Arapahoe grandstand as the horses race around the track, his new foray has his name being called over the loudspeaker as he navigates his way over jumps and through the adult amateur rankings at horse shows. He's doing it with a horse he's known for some time but only recently made the decision to call his own. It was just over two years ago that Horowitz decided to try his hand at riding. An active supporter of aftercare efforts for the horses at Arapahoe, he had gotten to know and become friends with CANTER Colorado trainer Ashley Gubich. One day while he was looking at some of the horses at her farm, Super G Sporthorses, she asked Jonathan if he rode. Over the next two years, Horowitz progressed through his beginner paces, learning to walk, trot and canter, and eventually began jumping and competing at local shows. One horse in particular he was riding regularly was Grand Moony, a mare Horowitz had known through several phases of her life. A maiden in eleven starts on the track, Grand Moony took to jumping and flatwork easily. Piloted by Gubich, she finished 11th in show jumping in last year's Thoroughbred Makeover. 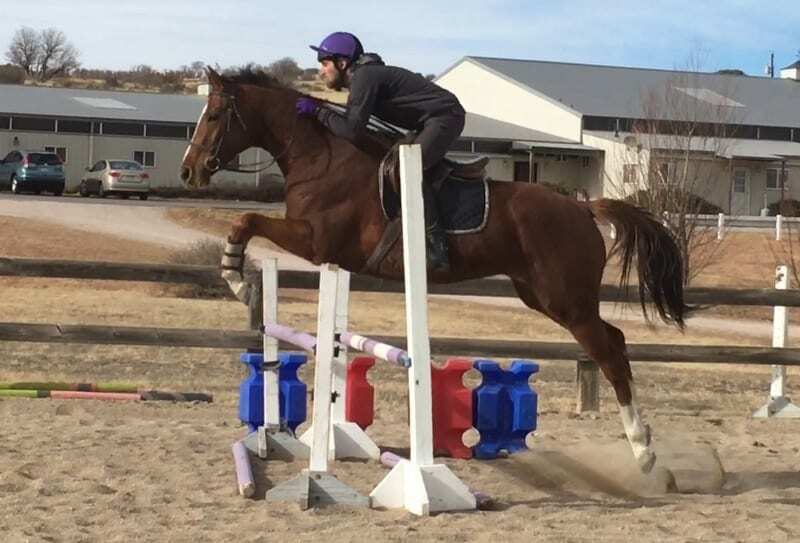 “The first time I rode her she was easy and relaxed, but the first time I really asked her to do some actual work, a bit of that chestnut mare attitude came out. She's very confident in her opinions,” said Gubich, who soon realized that the mare was quick to become bored by routine and needed variety in her training curriculum. Horowitz has now taken the mare to several shows, winning a blue ribbon for the first time this past weekend at a schooling show near Denver. Horowitz hopes to transition from hunter/jumper shows to eventing in the coming months and thinks the variety between the three disciplines (dressage, cross-country and stadium jumping) will appeal to them both. While riding is a fun pastime for Horowitz, he says it has also had a positive effect on his career, both in calling races and as an interviewer for Altitude TV. “I originally thought learning how to ride would give me more insight into how the jockeys ride races and would help my race calling, but it's been so much more beneficial than I'd ever imagined,” said Horowitz. “It's kind of like a football commentator who's a retired player and understands the sport on a different level than the rest of us and can articulate that to his audience. It's helped me to better understand horses' body language. I have a better understanding of what it takes for riders to pilot these thousand-pound animals and maneuver them through a race. The average fan probably thinks they just sit up there and steer the horse exactly where they want it to go. Jen Roytz is a marketing, publicity and comprehensive communications specialist based in Lexington, Kentucky. A native of Cleveland, Ohio, her professional focus lies in the fields of equine, health care, corporate and non-profit marketing. She holds board affiliations with the Make a Wish Foundation, Thoroughbred Aftercare Alliance and the Retired Racehorse Project, among others. She is the go-to food source for one dog, two cats and two off-track Thoroughbreds. This entry was posted in Aftercare Spotlight, Horse Care, NL List and tagged Aftercare Spotlight, Ashley Gubich, Cosequin Presents Aftercare Spotlight, Jen Roytz, Jonathan Horowitz, Thoroughbred aftercare, Thoroughbred Makeover, thoroughbred retirement by Jen Roytz. Bookmark the permalink.